This fundraising site was established to help elite rowers prepare to compete at international events representing the United States. But it also has lots of information on the racing venues, heats, and results, links to news articles and information on the rowers, and updates from the race. And if you have any questions, or can’t find things you’d expect to be here, please contact us. World-class athletes get further faster with a community behind them. Many thanks to the friends, families, neighbors and many generous others who donated funds here at this site, or through RallyMe or Venmo, or who made other in-kind donations! Your support made it possible for the boys to get to Bulgaria and back and rent equipment they needed to compete among the best in the world in July. And we also want to acknowledge the enormous role that the “donations” that are harder to quantify play in success: your words of encouragement, the interventions of a good coach, timely kindnesses on a hard day, and generous families taking the boys in so they could focus on training… We’re so very grateful for all of it. Thank you for your support! Please help the 2017 U23 Men’s Lightweight Double compete in Bulgaria! 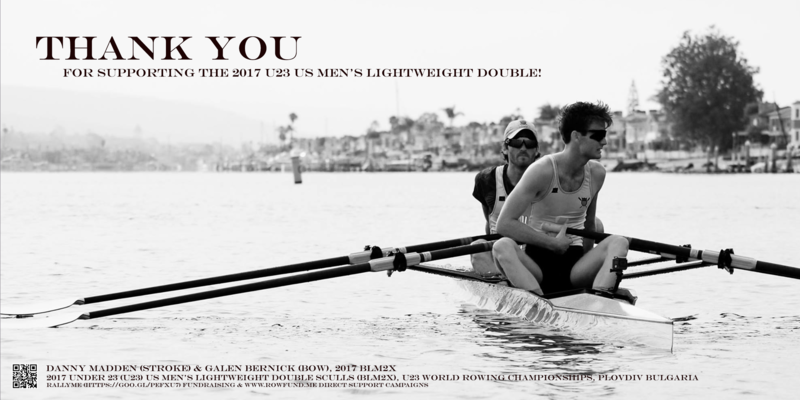 On Thursday, June 27, 2017, Galen Bernick and Danny Madden won at the 2017 USRowing Trials. The win earned them the privilege of representing the USA on the 2017 U23 USRowing National Team in Plovdiv, Bulgaria. They paid their dues and then some to make it to the U23 World Rowing Championships in Plovdiv, Bulgaria and the first round of racing is July 20! US rowers self-fund their travel to compete in the 2017 U23 World Rowing Championships. Costs also include lodging, coaching, and equipment. Galen and Danny are responsible for coordinating international travel for at least themselves (and a coach) from the airport to Plovdiv (and back home again). Equipment rental (shell, oars, etc.) is an additional cost – they need something to row and a way to move the boat once they get to the World Rowing Championship venue. The boys and their boat could use a little help from their friends. Strength, talent, stamina and grit only take you so far. No athlete with Olympic-sized dreams gets far without their community behind them, cheering in the wings and encouraging them to keep going, even when odds seem long. And this is why we’re asking. Those of you who know Galen and Danny may already have a sense of how amazing this win is, and how grateful they are for a shot at Worlds. It is nothing short of miraculous that they are on this path together in summer 2017 thanks to family, friends, coaches, mentors, even strangers, who all stepped up to encourage the boys in just the right ways at just the right moments. With your help in this short term fundraiser, they can remain focused on doing what they love for Team USA. Today they’re aimed at World Rowing Trials. Tomorrow? Maybe even Tokyo 2020. Let’s get them to Plovdiv! Can you help? Anything that can help Galen and Danny get to Bulgaria on time, intact, with everything they need in time to make the starting line on July 19-23 will be much appreciated!!! Immediate and direct funding support/reimbursement to rowers for travel and material costs of competition. NOTE: Donations are not tax deductible, but are much needed/appreciated! To donate toward future events, email us! Goal: Get the men’s lightweight rowers, their coach, and equipment to Bulgaria with the resources they need at the time they need them. Airfare Approximately $1800 per person – RT based on avg. including taxes and fees. Transport to Plovdiv Once they get to Bulgaria, it’s still about a 75 mile bus ride to Plovdiv. Equipment rental/transport They need to secure the same type of lightweight racing shell and rigging they’ve been using here in the US at the Bulgaria venue. They pay a premium for equipment, transport, insurance… Plus oars. Any funds raised in excess of the goal will be donated directly to Sea Base. If you wish to donate to either or both rowers to support their pursuit of future events, email us! Goal: Reimburse the rowers for receipts from 2017 World Rowing Competition. Team Fees USRowing charges a flat fee per athlete that covers the basics (food, lodging, and transportation at the venue) during competition. Receipts-based Contributions to this campaign will close July 30 and be distributed in Oct., minus a processing fee (8%). Excess funds raised “pay it forward” to USRowing’s 2018 National Team. Goal: Think global, act local couldn’t be more apt here. Sea Base / SoCal Scullers have nurtured Galen and Danny’s talent and rowing skills, and stoked their will to win. Donations to the club are tax deductible and managed through club contacts. Support for the “2017 US Men’s Lightweight Double” can include equipment rental and/or transportation subsidies. Sponsorship begins with conversation. Amateur athletes in the US have rules that impact their ability to participate in sports, and managing financial support/sponsorship appropriately is essential to supporting their ability to compete at elite levels (regional, national, World, Olympic). Email inquiries to: RowFundMe@gmail.com. We will gladly answer questions and help connect you to people you need to reach for these discussions! Whatever support you can provide, including sharing this site, and sending good thoughts with the team, is very much appreciated!